Can I run CameraFTPVSS.exe as a Windows service? This way I can set it to be running all the time, whether I'm logged onto the computer or not. This also works well too for occassions when the computer might accidenntally reboot, like during a momentary power outage or a brown out. The computer will come back on as soon as there is power again and the service starts right up, even though I haven't logged on to it. We are working on a new version that can run as a Windows service. The work has not finished. However, we can expedite it if we see enough demand. Please feel free to call/email us. There is a workaround solution: You just need to configure your Windows to log on automatically. If your Windows OS can log on automatically, then VSS software can start automatically. You might be concerned about potential security issues related with automatic login. Anybody (who can physically access your computer) can access your Windows without entering a password. You can physically lock the computer; also VSS has built-in security to prevent that. You can lock VSS by clicking on the Lock button in the toolbar. Please make sure you remember your CameraFTP account password. Once VSS is locked, it locks both VSS and the computer desktop. You must enter your CameraFTP password to unlock it. There are a few methods to configure Windows to log on automatically. After you download the batch file, right click on it and select Edit to open it in Notepad. Replace REAL_USERNAME, REAL_PASSWORD (and possibly REAL_DOMAIN) with your real username, password and domain name. Save the changes and close Notepad. Then you can right click on the "SetAutoWindowsLogin.bat" file and select Run as Administrator. Verify there is no error message. You can then restart the computer and check if it can log on automatically. You can manually edit Windows Registry follow the instructions there. 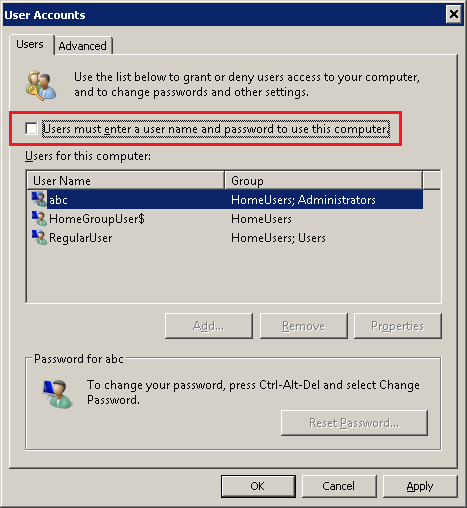 On the Users tab, uncheck the box next to "Users must enter a user name and password to use this computer", then click OK at the bottom of the window. When the Automatically sign in box appears, enter the username you wish to use for your automatic login. For Windows 10 or Windows 8 automatic login, if you use a Microsoft account, you must use the email address in the Username field. In the Password and Confirm Password fields, enter your Windows password. Click OK to close the dialog. You can then restart your computer to verify automatic login.